The North End and other low-lying areas along the historic Boise River floodplain tend to have soils with neutral pH and more clay. Clay soils do not drain as well and retain more moisture, so we can use some eastern natives. Concurrently, some foothill natives can rot out. The front of this house was being remodeled. 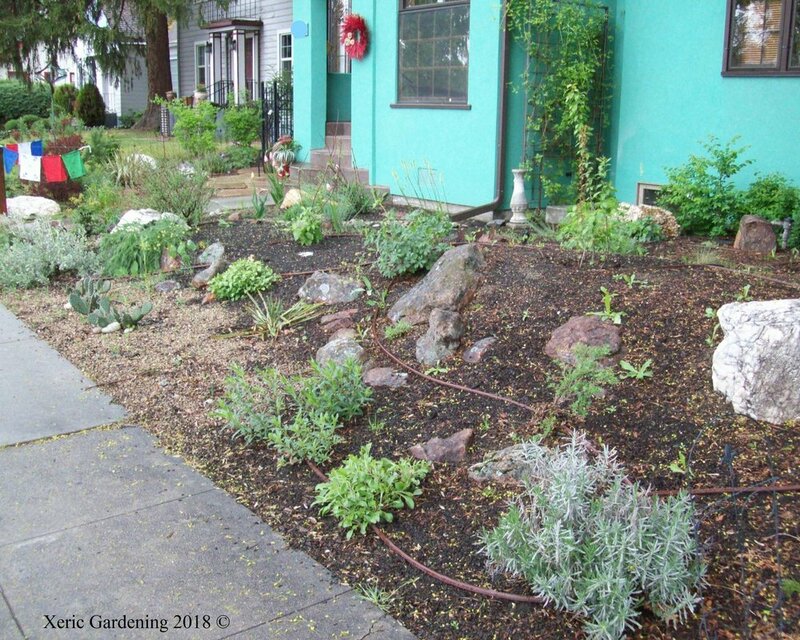 The lawn was destroyed and instead of reinstalling, the homeowners wanted a perennial garden. Berms and stone created a little more height. The Tibetan prayer flags kept the mail delivery people from walking through and damaging the plants. A great way to get rid of a lawn is by smothering it. 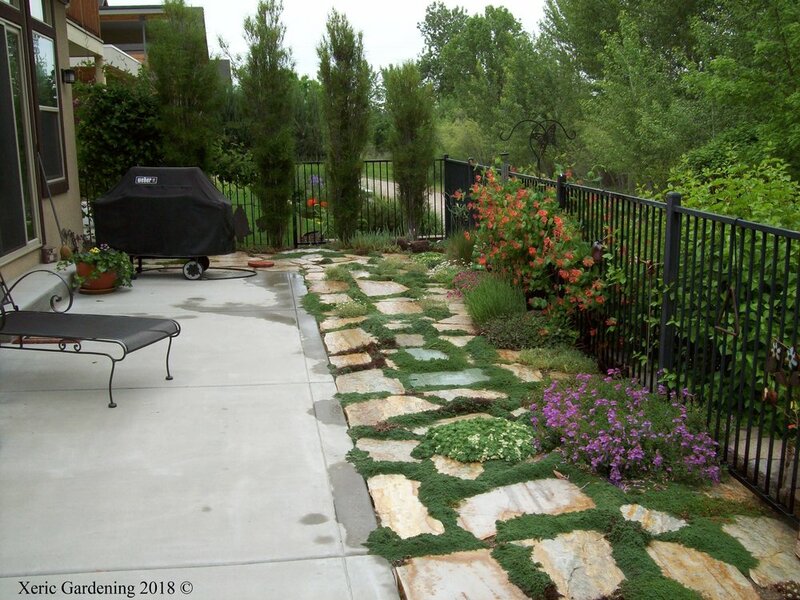 This way, there is no cost or labor to take sod away and bring topsoil in. The four sprinkler-heads in the corners were capped off. 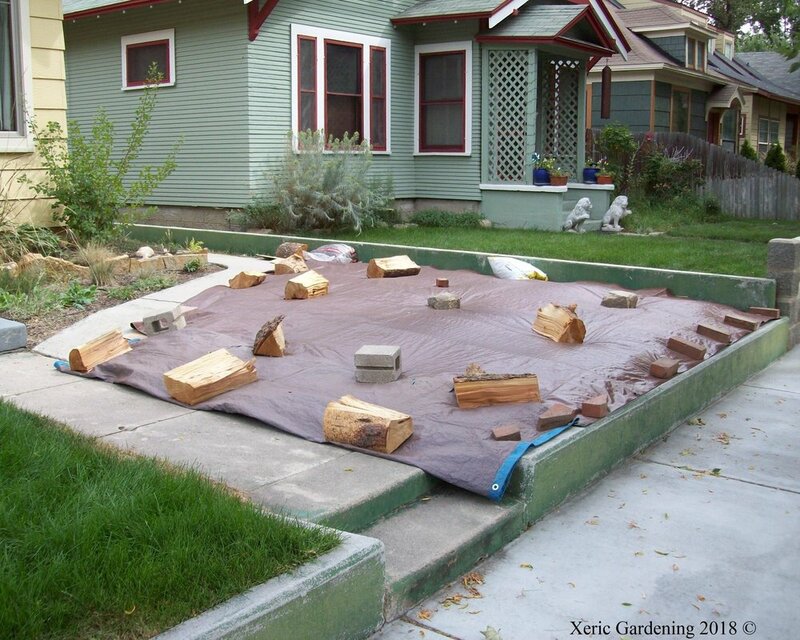 After converting to drip irrigation, the drip line is covered by mulch. As the mulch degrades, it will have to be reapplied. The white adapter in this picture can be artfully covered by ornamental stone. This property was already xeric but the client wanted a redesign. We removed the more aggressive plants. Client wanted to keep the sand mulch which has a really softening effect. We let some annuals persist, like the California poppy, while the other plants were filling in. We have chosen plants that will give different colors, textures, and bloom time, while staying tidier. Though we tend to have a more naturalistic style, xeric principles are easily applied to a more formal setting. This north-facing garden gets watered once a week.